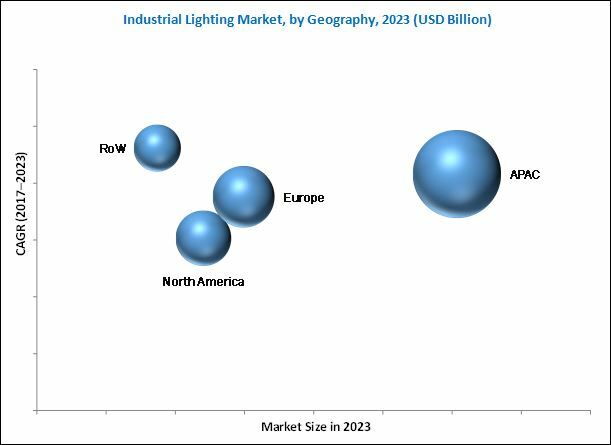 [164 Pages Report] The industrial lighting market was valued at USD 7.59 Billion in 2016 and is expected to be worth USD 13.17 Billion by 2023, growing at a CAGR of 7.82% between 2017 and 2023. 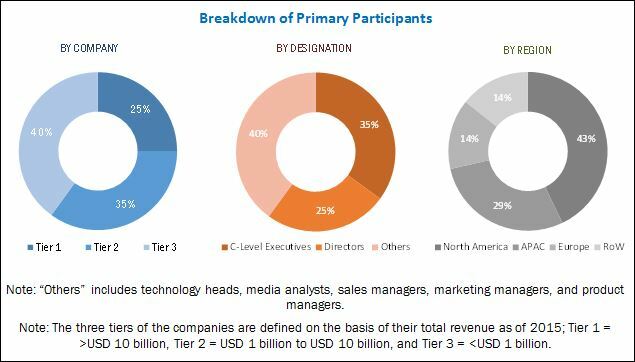 The objective of this report is to define, describe, and forecast the market size and growth potential of the industrial lighting market across different segments such as light source, offering, installation type, product, application, and geography. This report includes the forecast of the market size, in terms of value, with respect to four main regions North America, Europe, Asia Pacific (APAC), and Rest of the World (RoW). The study identifies and analyzes the market dynamics such as drivers, restraints, opportunities, and industry-specific challenges for the market. It also profiles the key players operating in the industrial lighting market. The base year considered for this report is 2016, and the forecast period for the market has been considered between 2017 and 2023. The growth of this market is driven by the factors such as increasing modernization and infrastructural development; growing penetration of LEDs, due to their reducing price, across diversified industrial applications; durability of LED lights for industrial usage; and low energy consumption by LEDs. The value chain of the overall industrial lighting market includes various activities and factors that help achieve a high level of performance with respect to a service or a product. The key players operating across the value chain of the industrial lighting market are Philips Lighting Holding B.V. (Netherlands), Hubbell Lighting, Inc. (US), Emerson (US), Legrand (France), Acuity Brands Lighting, Inc. (US), TOYODA GOSEI Co., Ltd (Japan), Cree, Inc. (US), General Electric (US) , Osram Licht AG (Germany), and Zumtobel Group (Austria). According to the MarketsandMarkets forecast, the industrial lighting market is expected to be worth USD 13.17 Billion by 2023, growing at a CAGR of 7.82% between 2017 and 2023. The major drivers for the market include modernization and infrastructural development, durability of LED lights for industrial usage, and low energy consumption by LEDs. The report covers the industrial lighting market on the basis of light source, offering, installation type, product, application, and geography. The study identifies and analyzes the market dynamics such as drivers, restraints, opportunities, and industry-specific challenges for the market. It also profiles the key players operating in the industrial lighting market. The factory and production lines application held a larger share of the industrial lighting market in 2016. Factory and production lines are upgrading to critical lighting solutions, such as LEDs and connected lighting solution, to receive an immediate payback on their investment through improved light quality and control. The factory and production lines is the largest application area for industrial lighting solutions. The variety of work performed in the industry can vary tremendously from production to machining. Therefore, every lighting solution needs to be customized according to the available space and the complexity of the task being performed. On the basis of product, the flood lighting/area lighting held the largest share in 2016, while spot lighting is expected to grow at the highest rate during the forecast period. Flood lighting or area lighting solutions are increasingly being used for the applications such as warehouses, industrial outer premises, and parking areas. These lighting solutions provide bright light to these areas and ensure its safety and security. This lighting system is one of the common products offered by many companies in their product portfolio. Asia Pacific (APAC) dominates the industrial lighting market; however, RoW is expected to grow at the highest rate during the forecast period. The countries in the RoW region are likely to witness an extensive growth in infrastructural building projects. Therefore, the market in this region is expected to exhibit a high growth. Low profit margin of LED lighting products may appear as a challenge for manufacturers in the industrial lighting market. The major vendors in industrial lighting market are Philips Lighting Holding B.V. (Netherlands), Hubbell Lighting, Inc. (US), Emerson (US), Legrand (France), Acuity Brands Lighting, Inc. (US), TOYODA GOSEI Co., Ltd (Japan), Cree, Inc. (US), General Electric (US), Osram Licht AG (Germany), and Zumtobel Group (Austria). These players adopted various strategies such as product launches and developments, contracts, acquisitions, partnerships, and business expansions to cater to the needs of the market.